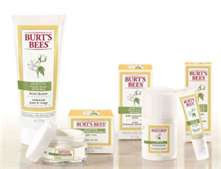 I have been a huge fan of Burt's Bees products for as long as I can remember. I have their chapstick in every room of my house, every bag I own and in the car. I was so excited when I got an invitation from Bzzagent to try out their new line of sensitive products. I knew they made products other than chapstick but I hadn't yet tried them. Well I was missing out. In my Bzzkit I got a face wash for sensitive skin as well as a face moisturizer for sensitive skin. I was amazed at how light the moisturizer was. Once I put it on I coudn't even tell it was there. Not only is it light but it is not greasy at all. The face wash is amazing. My skin really is rather sensitive and I am prone to breakouts. The Burt's Bees face wash again was very light and creamy. I found that it was very easy to wach off of my face and did not leave behind any greasy residue. I am now hooked on these products. I probably do not need them in every room as I do my Burt's Bees chapstick but I will be buying both products from now on.